A top view of the finished bases...well semi finished as a spray of Dulcote will totally complete the job. Well after a lovely weekend listening to the Second Ashes test from Adelaide Oval on the radio I managed to get a few things complete upstairs which left me quite chuffed with myself! One of them was the final touches to the casualty markers which I have been working on for the excellent Napoleonic General D'Armee rules. Some Brits and Nassau in this shot look slightly the worse for wear. I am quite pleased how they have come out and have only a spray of matting varnish needed to finish them off. I do, as I am sure you have all noticed, still put a coat of Humbrol 35 Gloss Varnish on all of my figures these days. 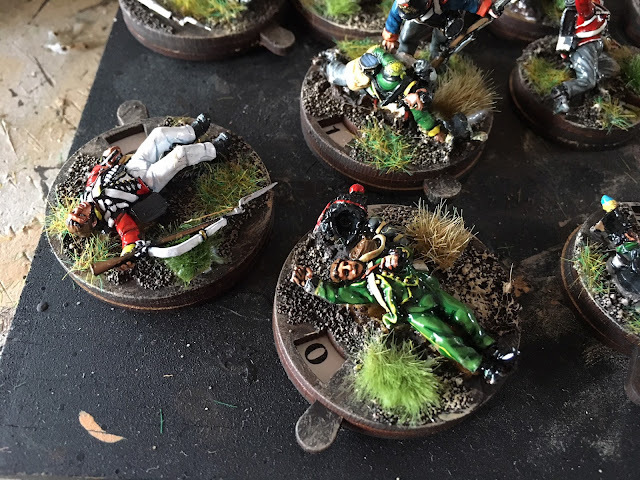 The reason is very simple and straight-forward in that I do like to protect the figures and find that the old fashioned oil enamel base varnish's give the maximum protection for wargaming figures in action. 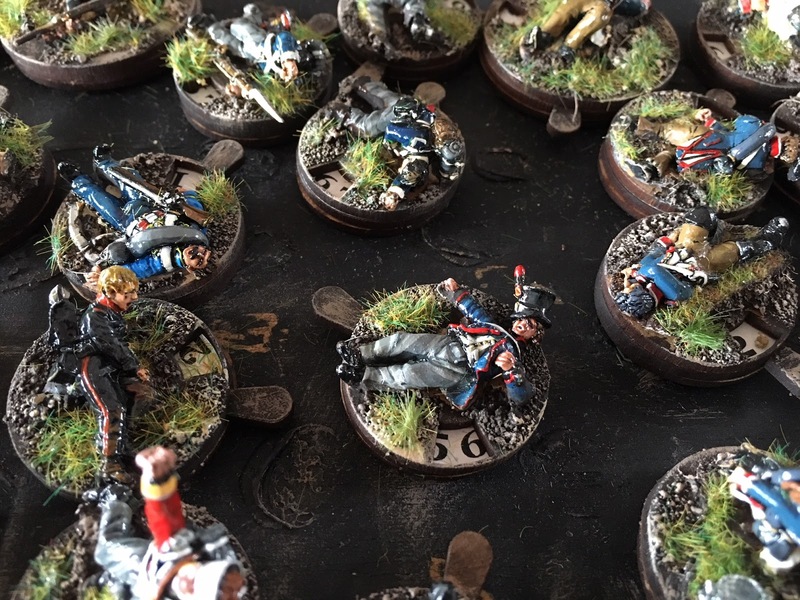 I find it very frustrating to remember back to my earlier days as a student spending hours and hours painting wargames figures only to find them scratched or slightly battered after a trip in the back of the car to the wargames club on a Wednesday night. Unfortunately in those younger days I never saw the benefit of varnishing. The gloss looks wonderful in my opinion and by the way I must admit to sometimes finding it very difficult to put the Dulcote over the top. However the level of protection given by using both in the process is second to none. Thank you Mark. The next batch are on the dials now incorporating a few more French, Russians, Austrians and some Bavarians. Varnishing was something I came to late as well. I think it used to be seen as unmanly. Of course now we are spoilt for choice, gloss, satin, or for those still in denial, matt. I've actually used PVA glue as a kind of varnish and James of the ANF put me on to Plasti-Dip which is great for soft plastic figures. 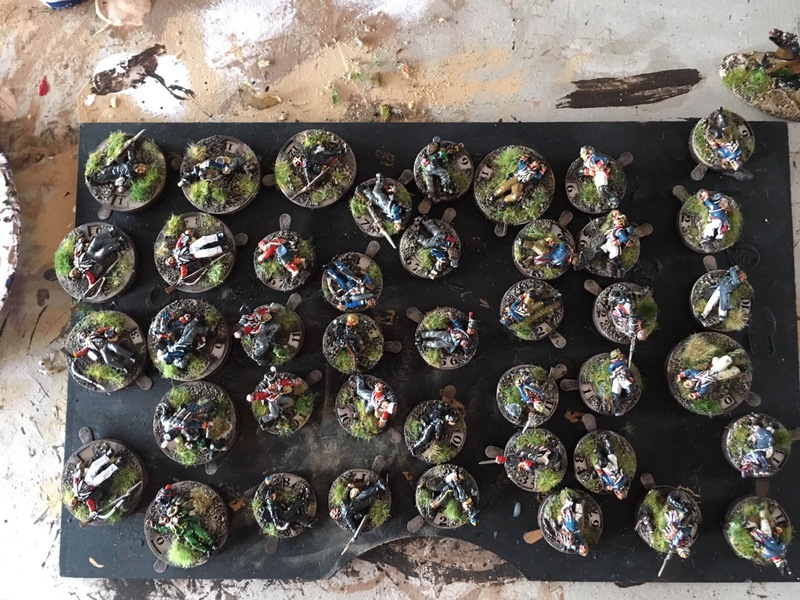 Thanks very much Mark and I must say, the varnishing has assisted my figures in some battles against chaps who used to grab battalions by the handful to move them from years gone by at the club! Lovely job - keep up the matt varnishing - realism rules!!! Love the comment Chris and yes, more Dulcote is on the cards for most of my gloss coated figures let me assure you.